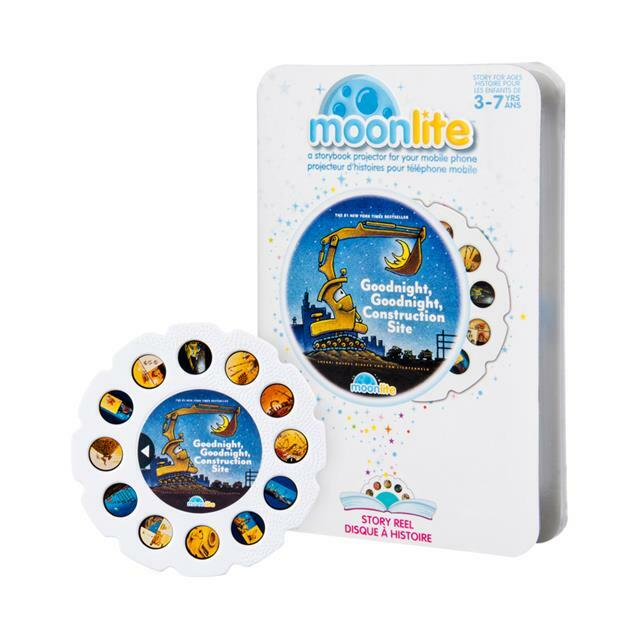 Story time enchantment continues with Moonlite's individual story reels! Now you can add a new tale to your Moonlite collection: Goodnight, Goodnight, Construction Site, written by Sherri Duskey Rinker and illustrated by Tom Lichtenheld. Introduce your child to a wonderful story they'll want to hear again and again! Slide the story reel into the Moonlite projector (sold separately), snuggle in with your child and use the free app to read along to beautiful projected illustrations! You can even use the in-app sound effects to create a truly immersive reading experience. As kids hear the story of Goodnight, Goodnight, Construction Site, they'll develop their language skills and a love of reading and learning. Cozy up for story time with Moonlite's Goodnight, Goodnight, Construction Site!